Testosterone replacement therapy (TRT) is a widely used treatment for men with symptomatic hypogonadism. The benefits seen with TRT, such as increased libido and energy level, beneficial effects on bone density, strength and muscle as well as cardioprotective effects, have been well-documented. TRT is contraindicated in men with untreated prostate and breast cancer. Men on TRT should be monitored for side-effects such as polycythemia, peripheral edema, cardiac and hepatic dysfunction. Drugeluting metal stents (DESs) have been extensively used in coronary and vascular disease. This type of stents has been proven to provide significantly lower restenosis rates due to the reduction of neo-intimal hyperplasia in comparison to the traditionally used bare metal stents (BMSs). 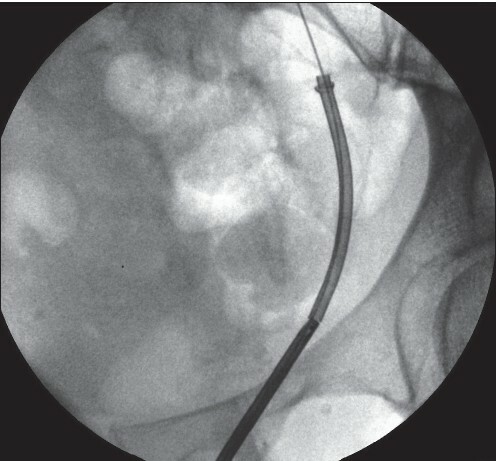 The latter stents have been evaluated for more than a decade in urological practice in an attempt to provide permanent relief of urethral or ureteral obstruction. Although the initial results were promising, long-term experience revealed significant complications, which are mainly attributed to stent-related hyperplastic reaction compromising stent patency. The favorable experience of vascular DESs led to the application of DESs in both the urethra and ureter of animal models. These experimental results demonstrated a reduction of hyperplastic reaction of DESs in comparison to BMSs. Nevertheless, clinical data are currently not available. Considering the fact that DESs are under continuous development, the use of DESs in urology holds promise for the future and seems to be an intriguing field. Introduction: One of the main benefits of robotic surgery is the surgeon's three-dimensional (3D) vision system. The purpose of this study is to evaluate the efficacy of 3D vision using a flat screen and polarized glasses for surgical skills during robotic surgeries. 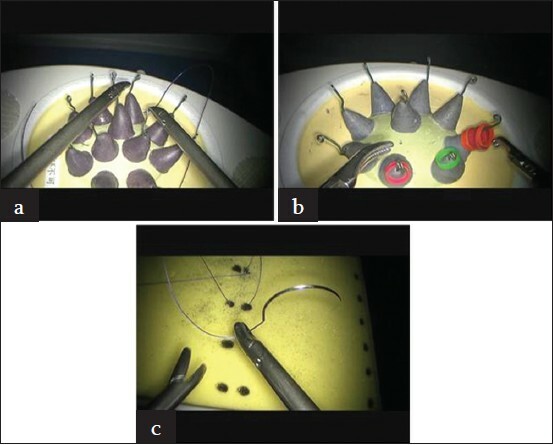 Materials and Methods: In an experimental model, six surgeons performed three surgical tasks with laparoscopic devices using a standard 2D and a flat-screen 3D model with polarized glasses. Performance times were compared between two-dimensional (2D) and 3D vision for each task. The surgeons also graded the efficiency of the 3D system, on a subjective scale of 0-100. Results: Performance times for task 1 (seven holes) and 2 (elastic bands) were significantly reduced by 84% and 56% using 3D compared with a 2D system and experienced surgeons performed all three tasks faster in 3D than 2D. The surgeons reported the polarized glasses were comfortable to wear and direct vision was seldom affected. Conclusions: The use of 3D visualization seems to improve the efficiency of surgical skills during robotic surgery and reduce performance time for characteristic surgical procedure tasks. Introduction: The correction of fossa navicularis strictures poses a distinct reconstructive challenge as it requires attention to cosmesis, in addition to urethral patency. Different graft and flap based repairs have been described with variable success rates. However, the ideal management remains unclear. The feasibility and efficacy of a single stage ventral onlay buccal mucosa graft urethroplasty (VOBMGU) for navicular fossa strictures (NFS) was evaluated in the present study. 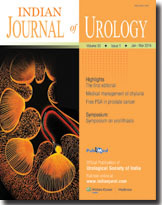 Subjects and Methods: All patients with NFS attending urology out-patient department from March, 2009 onward accepting VOBMGU were evaluated prospectively. Patients with minimum 1 year of follow-up were included for analysis. The technique involves opening the diseased stenosed meatus ventrally up to the corona. The diseased mucosa is excised leaving a midline strip of native urethral mucosa on the dorsal side. The buccal mucosal graft (BMG) is fixed on either side of this strip over a 24 Fr. silicone catheter. The glans wings are apposed in midline taking anchoring bites on the mucosal graft ventrally. Post-operatively patients were reviewed at 1, 3, 6 and 12 months and annually thereafter. Cosmetic acceptance and splaying of the urinary stream was assessed with individual questionnaires. Results: A total of six patients underwent VOBMGU. Average flow rate at 3 months post-operatively was 12 ml/s. The end result was cosmetically highly acceptable. There was no fistula in any of the cases. With a median follow-up of 37 months, only one patient had a recurrence of stricture in a proximal site. Conclusions: VOBMGU is a viable technique for reconstruction of NFS with promising short term results. However, long-term follow-up is necessary. Introduction: Filarial chyluria is a common problem in filarial endemic countries. Its management begins with medical therapy but some patients progress to require surgery. The present study aimed to determine factors affecting response to medical management in patients of filarial chyluria. Materials and Methods: This prospective study conducted between August 2008 and November 2012, included conservatively managed patients of chyluria. Demographic profile, clinical presentation, treatment history and urinary triglycerides (TGs) and cholesterol levels at baseline were compared between the responders and non-responders. Apart from the clinical grade of chyluria, hematuria was evaluated as an independent risk factor. Results: Out of the 222 patients (mean age, 37.99 ± 13.29 years, 129 males), 31 patients failed to respond while 35 had a recurrence after initial response; the overall success rate being 70.3% at a mean follow-up of 25 months. No difference was observed in demographics, clinical presentation, presence of hematuria, disease duration and mean urinary TGs loss between responders and non-responders. On multivariate analysis, patients with treatment failure were found to have a higher-grade disease (14.3% Grade-I, 36.6% Grades-II and 60% Grade-III), higher number of pretreatment courses (1.59 ± 1.08 vs. 1.02 ± 0.79) and heavier cholesterol (26.54 ± 23.46 vs. 8.81 ± 8.55 mg/dl) loss at baseline compared with responders (P < 0.05). Conclusion: Conservative management has a success rate in excess of 70%, not affected by the disease chronicity, previous episodes and recurrent nature. However, higher-grade disease, extensive pre-treatment with drugs and higher urinary cholesterol loss at baseline are the predictors of poor response. Hematuria is not an independent poor risk factor for conservative management. Introduction: Free to total prostate specific antigen ratio (f/t PSA) has been used to help improving specificity of PSA in the range of 4-10 ng/ml based on the data on population based screening. There is no data on test characteristics of f/t PSA in men presenting with clinical symptoms of benign prostatic hyperplasia (BPH). This study is aimed to determine the usefulness of f/t PSA in symptomatic men. Methodology: From January 2006 to June 2012, men of 50-75 years with lower urinary tract symptoms (LUTS), normal rectal examination and PSA between 4-20 ng/ml had free and total PSA assessment. Men with clinical evidence of prostatitis, retention, history of 5α blocker reductase inhibitors and those who had surgery or biopsy on the prostate in last 3 months were excluded. Receiver operating characteristic curves were derived for f/t PSA and total PSA. The effect of age, prostate volume and Gleason score on the f/t PSA was also analyzed. All statistical analyses were performed on SPSS 16 (Chicago, USA). Results: Out of 170 men with the mean age of 67.4 ΁ 6.6 years, 43 (25.3%) had cancer on biopsy. 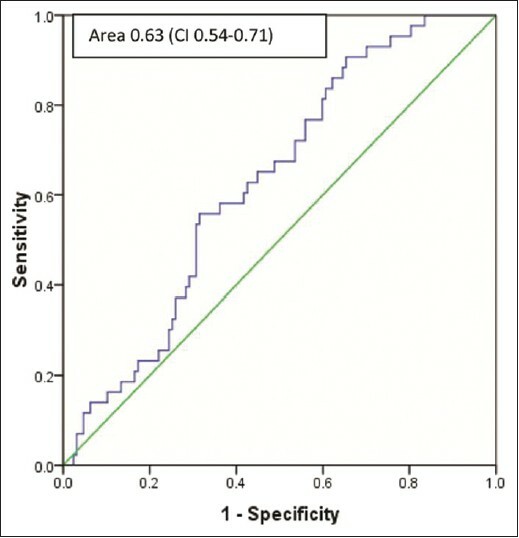 Area under the curve for predicting the presence or absence of prostate cancer in all the men with f/t ratio was 0.63 (confidence interval [CI]: 0.54-0.71). The median value of f/t PSA for men with cancer was 5.5% (1-25%) and 9.2% (1-63%) for those with no cancer. Cut-offs derived at 95% specificity at PSA between 4-10 ng/ml and 4-20 ng/ml were 0.5% and 1% respectively. The specificity of f/t PSA ratio at cut-off levels 7%, 10% and 15% was 73%, 60%, 45% for PSA range of 4-10 ng/ml and 63%, 47% and 35% for PSA range of 4-20 ng/ml PSA. Age, prostate volume and Gleason grade did not show any effect on f/t PSA. Conclusion: In men with LUTS the specificity of various f/t PSA ratio cut-offs; described for population based screening, is too low to be used as an aid to defer the decision of biopsy in PSA ranges of 4-20 ng/ml. Objective: To evaluate the impact of histology on cancer-specific and overall survival for patients with metastatic renal cell carcinoma (mRCC) undergoing cytoreductive nephrectomy (CN). Materials and Methods: We retrospectively reviewed the data of 505 patients with mRCC who underwent CN at Mayo Clinic, Rochester, MN, USA, between 1970 and 2008. All specimen were re-reviewed by a single genitourinary pathologist. 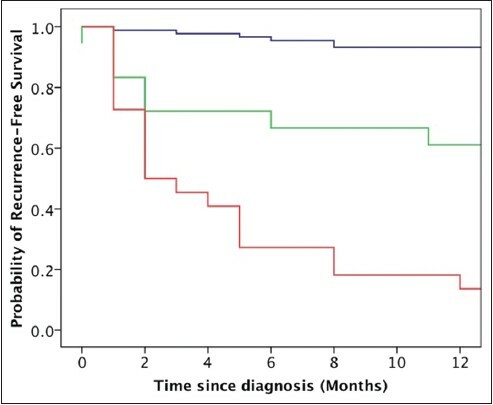 Survival was estimated using the Kaplan-Meier method and compared according to histology with the log-rank test. Cox proportional hazard regression models were used to evaluate the association of histology with outcome. Results: Forty (8%) patients with non-clear cell histology and 465 (92%) patients with clear cell histology were identified. The median follow-up was 7.8 years. 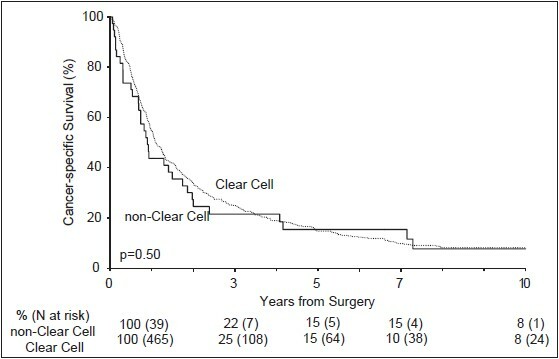 Metastatic non-clear cell histology was associated with a significantly older median age at nephrectomy (66 vs. 60 years; P = 0.002), larger median tumor size (11.5 vs. 9.2 cm; P = 0.02), and higher rate of lymph node involvement (50% vs. 16%; P < 0.001). No significant difference in 3-year cancer-specific survival (25% vs. 22%; P = 0.50) was noted between patients with clear cell and non-clear cell histology. On multivariate analysis, non-clear cell histology was not significantly associated with patients' risk of death from cancer (HR 0.96; 95% CI 0.61, 1.51; P = 0.85). Conclusions: Non-clear cell histology was not independently associated with adverse survival for patients with mRCC undergoing CN. 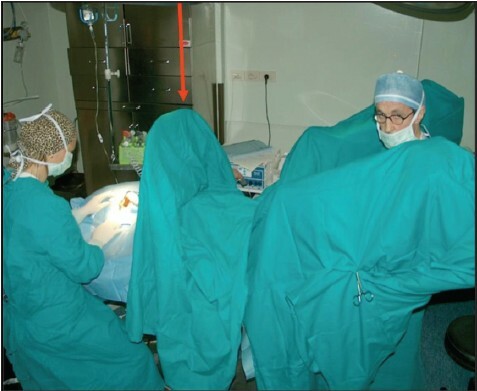 As such, we advocate that surgical resection should continue to be considered in the multimodal treatment approach to these patients, while additional efforts to risk stratify and optimize management in this setting remain necessary. The epidemiology of kidney stones is evolving - not only is the prevalence increasing, but also the gender gap has narrowed. What drives these changes? Diet, obesity or environmental factors? This article will review the possible explanations for a shift in the epidemiology, with the hope of gaining a better understanding of the extent to which modifiable risk factors play a role on stone formation and what measures may be undertaken for disease prevention in view of these changing trends. The pathophysiology of nephrolithiasis is not fully understood. The pioneering work of Alexander Randall in the 1940s sought to clarify our understanding of stone formation. This review traces the inception of the theory of Randall's plaques and the refinement of the hypothesis in the early days of kidney stone research. It then reviews the contemporary findings utilizing sophisticated investigative techniques that shed additional light on the pathophysiology and redefine the seminal findings of Dr. Randall that were made 70 years ago. Imaging for urolithiasis has evolved over the past 30 years. 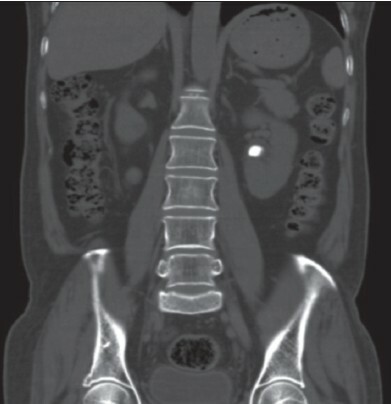 Currently, non-contrast computed tomography (NCCT) remains the first line imaging modality for the evaluation of patients with suspected urolithiasis. NCCT is a dominant source of ionizing radiation for patients and one of its major limitation. However, new low dose NCCT protocols may help to reduce the risk. Fluoroscopy use during operating room (OR) surgical procedures can be a substantial source of radiation for patients, OR staff and surgeons. It is important to consider the amount of radiation patients are exposed to from fluoroscopy during operative interventions for stones. Radiation reduction can be accomplished by appropriate selection of imaging studies and multiple techniques, which minimize the use of fluoroscopy whenever possible. The purpose of this manuscript is to review common imaging modalities used for diagnosing and management of renal and ureteral stones associated with radiation exposure. We also review alternatives and techniques to reduce radiation exposure. Management of ureteric strictures is a challenging task. Subtle presentation, silent progression and complex aetiology may delay diagnosis. A wide range of available treatment options combined with the lack of adequate randomised trials has led to the introduction of personal bias in the management of this difficult group of patients. Metallic ureteric stents offer an alternative to the conventional treatment modalities. A review of the currently available metallic stents and their role in the long-term management of ureteric strictures is presented. Materials used in the manufacture of indwelling urological devices are evolving all the time. Improved endo-urological techniques combined with new devices made from better compounds will continue to improve patient experience. Introduction: The majority of staghorn classifications do not incorporate volumetric stone burden assessment. Accurate volumetric data can easily be acquired with the ever-increasingly available computerized tomography (CT) scan. This manuscript reviews the available staghorn stone classifications and rationalizes the morphometry-based classification. Materials and Methods: A Pubmed search was performed for articles concerning staghorn classification and morphometry. Twenty abstracts were shortlisted from a total of 43 published abstracts. In view of the paucity of manuscripts on staghorn morphometry (4), older staghorn classifications were analyzed with the aim to determine the most optimum one having relevance to the percutaneous nephrolithotomy (PCNL) monotherapy outcome. Results: All available staghorn classifications are limited with non-widespread applicability. The traditional partial and complete staghorn are limited due to non-descript stone volumetric data and considerable overlap of the intermediate ones in either group. A lack of standardized definition limits intergroup comparison as well. Staghorn morphometry is a recent addition to the clinical classification profiling of a staghorn calculus. It comprises extensive CT volumetric stone distribution assessment of a staghorn in a given pelvi-calyceal anatomy. It allowsmeaningful clinical classification of staghorn stones from a contemporary PCNL monotherapy perspective. Conclusions: Morphometry-based classification affords clinically relevant nomenclature in predicting the outcome of PCNL for staghorn stones. Further research is required to reduce the complexity associated with measuring the volumetric stone distribution in a given calyceal system. Accurate reporting of complications is an essential component to critical appraisal and innovation in surgery and specifically with percutaneous nephrolithotomy (PCNL). 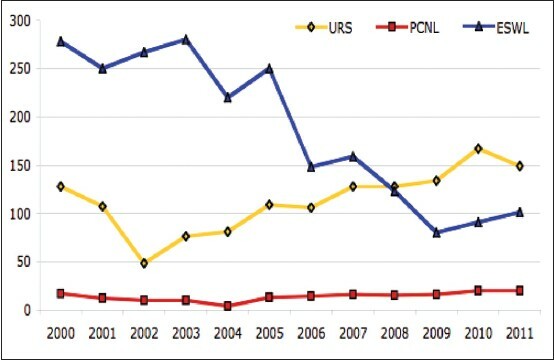 We review the evolution of complication reporting for PCNL and suggest future directions for innovation. A selective review was carried out using Pubmed. Key search terms and their combinations included percutaneous, anatrophic, nephrolithotomy, PCNL, complications, Clavien, Martin score, bleeding, bowel injury, perforation, fever, sepsis. The references from relevant papers and reviews as well as AUA and EAU guidelines were also scanned for inclusion. PCNL has become the procedure of choice for large renal stones owing to decreased morbidity over alternative procedures. Both common and rare complications have been described in large case series, small randomized controlled trials, and case reports in an unstandardized form. Although these reports have provided an informative starting point, a standardized complication reporting methodology is necessary to enable appropriate comparisons between institutions, time periods, or innovations in technique. The Clavien-Dindo grading system has become widely accepted in urology and has facilitated the study of PCNL complications. Future research should focus on adaptions of this system to render it more comprehensive and applicable to PCNL. The natural course of untreated asymptomatic caliceal calculi has not been clearly defined, especially in terms of disease progression, and the indications for and outcomes of surgical intervention are not precise. Caliceal stones may remain asymptomatic but, in case of migration, ureteral calculi can cause acute ureteric colic with severe complications. The decision for an active treatment of caliceal calculi is based on stone composition, stone size and symptoms. Extracorporal shock-wave lithotripsy (ESWL) has a low complication rate and is recommended by the current guidelines of the European Association of Urology as a first-line therapy for the treatment of caliceal stones <2 cm in diameter. However, immediate stone removal is not achieved with ESWL. The primary stone-free rates (SFR) after ESWL depend on stone site and composition and, especially for lower pole calculi, the SFR differ widely from other caliceal stones. 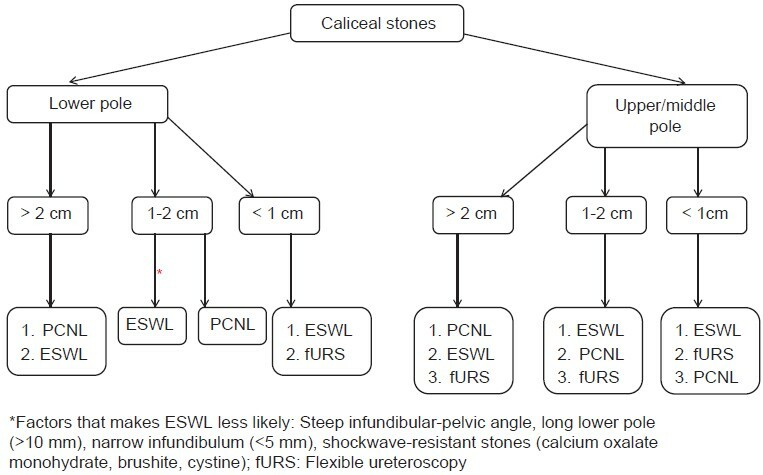 Minimally-invasive procedures including percutaneous nephrolithotomy and ureteroscopy are alternatives for the treatment of caliceal stones, associated with low morbidity and high primary SFR when performed in centers of excellence. 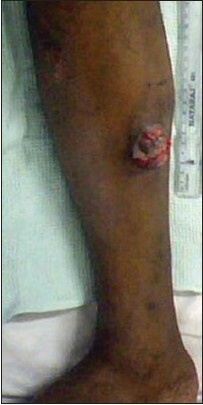 The skin is an unusual site of metastases from solid organ malignancies. 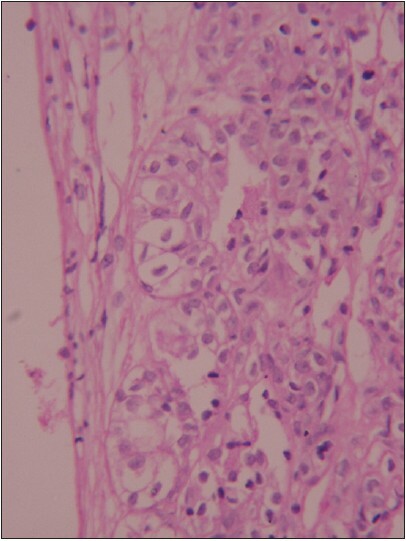 We report the case of a patient with a malignant mixed non-seminomatous germ cell tumor of the testis, presenting with cutaneous metastasis, which was treated with salvage chemotherapy. Metastasis to the inguinal lymph nodes is a rare event in bladder cancer. In general, tumors at the metastatic foci are histologically similar to the primary. We report a metastatic adenocarcinoma in the inguinal lymph node from a primary, pure transitional cell carcinoma after radical cystectomy. 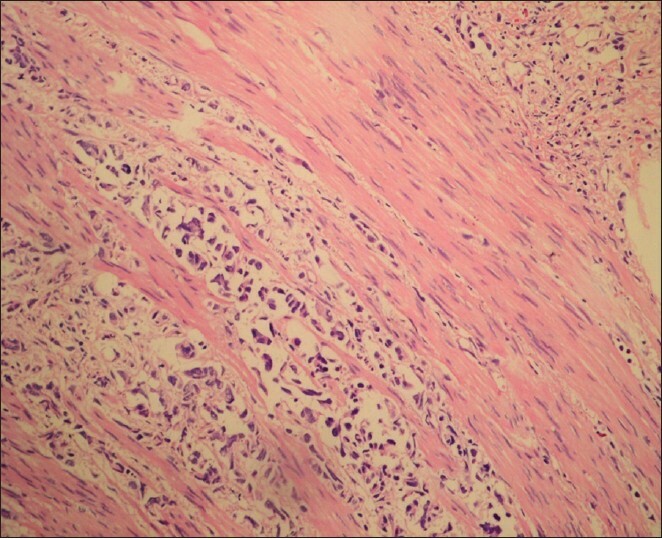 The nested variant of urothelial carcinoma is a rare but very important histological entity due to its deceptively bland-looking appearance and aggressive behavior. We present a case of a 30-year-old man who was found to have a solitary polypoid growth in the bladder. It was resected and found to be a fibroepithelial polyp; a rare entity in itself, harboring the above tumor. The lesion also showed a second population of scattered bizarre stromal cells. To our knowledge, this is the first instance of a nested variant of urothelial carcinoma arising in a fibroepithelial polyp. The presence of atypical stromal cells has also not been described previously. Hepatic portal venous gas (HPVG) is an uncommon radiological sign and often portends significant underlying abdominal disease. A number of conditions may produce this sign and identifying the underlying etiology is essential for management. The advent of ultrasonography-color Doppler imaging and computerized tomography has led to more frequent recognition of this condition. This article describes the very rare association of HPVG in a patient with emphysematous pyelonephritis. We present a case of 52 year old man who presented with bilateral painless testicular swelling. 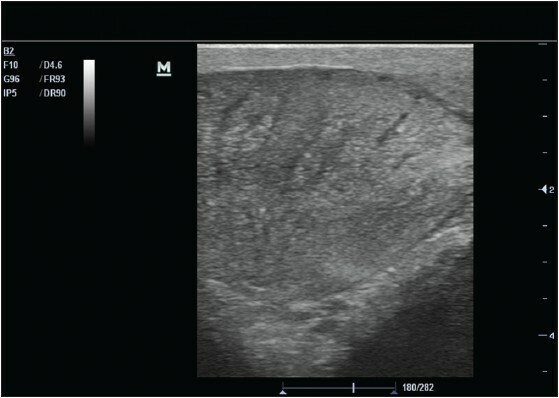 On evaluation with high resolution ultrasonography of the scrotum, typical "striated pattern" which is highly suggestive of Non Hodgkins lymphoma of the testis was seen. The patient underwent bilateral inguinal orchidectomy and the histopathological examination confirmed the diagnosis of Non Hodgkins lymphoma. There are no standardized radiological investigations in a patient with chyluria. Retrograde pyelography (RGP) is usually done to demonstrate pyelo-lymphatic reflux before invasive therapy in the form of sclerotherapy and surgery. 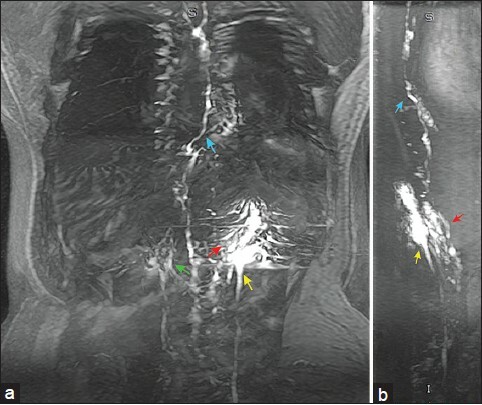 We describe magnetic resonance-RGP using gadolinium to demonstrate pyelo-lymphatic reflux in addition to the other intra-abdominal details provided by MRI. The advantages of this technique include avoidance of ionic contrast media and radiation exposure and possibility of better understanding of the disease pathophysiology. Oral mucosa has been the most popular substitute material for urethral reconstructive surgery because it is easy to harvest, is easy to access, has a concealed donor site scar, and obviates most of the problems associated with other grafts. However, the success of using oral mucosa for urethral surgery is mainly attributed to the biological properties of this tissue. Herein, the surgical steps of harvesting oral mucosa from the inner cheek are presented with an emphasis on tips and tricks to render the process easier and more reproducible and to prevent intra and post-operative complications. The following steps are emphasized: Nasal intubation, ovoid shape graft, delicate harvesting leaving the muscle intact, donor site closure and removal of submucosal tissue.